On my 3rd trip to Belize, I finally managed to make it to the Belize Zoo and immediately kicked myself for not having stopped here on previous trips. If you are at all interested in the animals native to Belize, this place will be a winner. The zoo is a small place (29 acres), easy to see in about 2 hours or less, and has personality (the handwritten signs that rhymed were a favorite). The cages encompass the animals' natural habitat, making it seem less like a zoo and more like a wildlife encounter. And the jaguars really are that impressive up close. After visiting, it is easy to see why this place is called "The Best Little Zoo in the World." The Zoo was founded in 1983 by Sharon Matola, a movie production assistant who was left with 17 animals after the filming of a rainforest documentary. Too tame after being used in the film, these animals could not be released back into the wild and the Belize Zoo was born. The Zoo's purpose is to educate Belizeans and foreigners about the wildlife native to Belize. Currently, the Zoo has over 175 animals, all rescued, orphaned, or born at the Zoo. The Zoo works to educate schoolchildren on the importance of conservation and also works with farmers to lessen conflicts with wildlife. It is a tall order, but they are doing an impressive job. Belize is blessed with an abundant and colorful population of native birds, a few of which you can see at the Zoo. I am partial to Toucans myself--chalk it up to all the Froot Loops I ate as a child. Belizeans like the keel- billed toucan too, it is their national bird. They vocalize with a croaking sound- almost like a high pitched frog. The Fer-de-lance was a hit with the kids (because super poisonous snakes always are) but I liked the Morelet's Crocodile. They live in the freshwater as opposed to the American Crocodile who likes saltwater. Belize has both species of crocodile, but attacks are very rare. In the past decade there have been just 12 attacks, 2 of which were fatal. Still, having seen this guy (gal?) up close, I decided not to do anymore swimming in the river. Spider and Howler monkeys are two of the species endemic to Belize, and the Zoo gives you a great opportunity to see them closer to their preferred level of living in the treetops due to their elevated viewing platforms. We watched the howler monkeys for awhile-- there was a baby howler monkey determined to climb up a specific branch but he kept falling off. Took him about 20 tries but he finally made it. We cheered. This spider monkey was doing a full body stretch. The Jaguars are the big draw for the Zoo and rightfully so, they are impressive animals that are rarely seen in the wild. All of the jaguars at the zoo were captured after they became "problem animals" meaning they realized goats and sheep conveniently fenced in make way easier meals than actually hunting. Most of these jaguars would have ended up on the wrong end of a gun had the Zoo not taken them. Junior is the exception as he was born at the Zoo. His Mom was sent to the Zoo after she began hunting livestock but her pregnancy was not apparent until after her arrival. Unfortunately, she rejected Junior not long after his birth and he was then hand-raised by Zoo staff. He is not releasable due to his familiarity with people. You can pay extra to do an animal encounter with Junior, where you can see him up close. New arrival. Still doesn't look too sure about his new home. 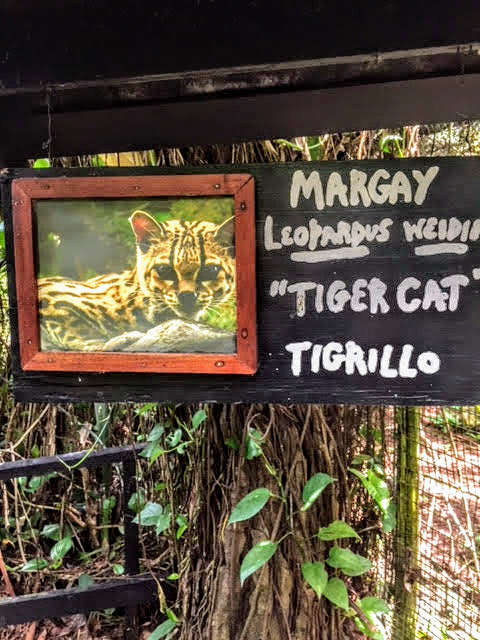 There are a few other native cats found at the Zoo: the Margay, Ocelot, Puma, and the Jaguarundi. The pumas (aka cougar/ mountain lion) were asleep in the undergrowth during our visit and only barely visible. I hear they are a highlight of the night tour if you are able to do that. The margay and ocelots look like smaller versions of a jaguar. The margay actually looks like a teacup version of a jaguar, weighing only 5-8 pounds. The jaguarundi might be the most unusual looking of all the cats, a mashup of an otter with a house cat's face. I had never heard of one before so they go in the "learn something new everyday" box. The ocelot in particular is fun because he loves people (he was a former pet that the owners gave up once they realized an ocelot makes a very bad pet). He will come right up to the fence and purr although the Zoo has had to install double fencing to keep people from trying to stick their hands in to pet him. He will bite despite his friendliness which is why ocelots make bad pets. Make sure the sound is on so you can hear this guy! The Tapir is the national animal of Belize and is colloquially called a "mountain cow" but they are actually more closely related to horses and rhinos . There is something pretty special about a country that picks such a gentle creature as its mascot. The little guy is called Fuego because he was separated from his Mom during a wildfire. The Zoo took him in and one of the resident tapirs looks after him. Fuego now works as ambassador to educate people about fire safety and to end irresponsible burning practices. You can see why tapirs are called "mountain cows." Baby Fuego and his friend. The Zoo's website has a more complete list of the animals found- just hover over the Visitor Information tab, then The Animals to see the buttons for Mammals, Reptiles, and Birds. Parking lot and Zoo entrance. That's our van from William's Belize Shuttle on the left. The Belize Zoo is easy to find as it is just off the main road between Belize City and San Ignacio. The entrance has a sign from the highway. Many people stop at the Zoo on their way to or from the international airport in Belize City (it's about an hour's drive from the airport to the zoo). Parking is free. How Long Should I Plan On Staying And When Should I Go? The Zoo recommends 1-2 hours to see everything, but I would plan on 2 hours. That is how long we spent on a pretty thorough tour but not one where we lingered too much. It was hot and we were sweating. On that hot and sweaty note, I would definitely recommend going in the morning, as close to the 830am opening time as you can manage. The zoo is open until 5pm but not sure many of the animals would be doing much in the hot afternoon. ***There is a night tour available for those staying in the area. It starts around 7pm and lasts about an hour. We did not have a chance to do this, but it is definitely on the list for a return visit. Many of the cats are far more active at night. Main Building where ticket office, gift shop, and Harpy Cafe are located. Entrance fees are $15 USD for adults and $5 kids for foreigners (less for Belizeans). Credit cards are accepted at the ticket office, which is in the main building. There is a small gift shop here as well. There are bathrooms in the parking lot but not in the Zoo so make sure to hit those before you enter. The Harpy Cafe is in the main building by the Ticket Office and looks like a nice little place with decent prices for Belizean staples such as rice and beans but also universal kid favorites like hot dogs and burgers. No AC if you are looking for a break from the heat and humidity. The cafe does have fans though. The Zoo is fairly accessible for those with mobility issues and those pushing kids in strollers as it is flat and the paths are packed dirt or pea gravel. Some of the elevated platforms for the monkeys involve stairs. Bring bug spray! All of the enclosures show the animals in their natural habitat, which is the jungle. Mosquitoes can be bad, especially in the morning. We did not have any issues but we loaded everyone up on the Family Off in the parking lot. Bring water. Along that jungle theme mentioned above, the Zoo is very hot and humid. By the end of our 2 hour tour, we were all sweaty and drinking lots of water. You cannot bring food into the Zoo but water bottles and backpacks are fine. Grab a map. There is a box on the wall next to the ticket desk where people drop off maps for the next person to use. Wear comfortable shoes. We walked for 2 hours straight. Stop to read the quirky signs. They are handpainted, some of them rhyme, and all of them are informative. Check out the FAQ page of the Zoo's website for more advice. If you are interested in getting up close and personal with some of the animals- look into an Animal Encounter on the website. The Zoo also operates the adjacent Tropical Education Center (TEC) which has dormitories, cabanas, and larger guest houses that accommodate families. There is electricity but no AC (does have fans though). Prices are reasonable and include dinner and breakfast. The best option if you are thinking about the night safari. Owned by the filmmaker in charge of the documentary that started the Belize Zoo, this guesthouse has a close relationship with the Zoo and is recommended on their accommodation page. It also gets pretty good reviews on TripAdvisor and booking.com. No AC but does have fans and rates include breakfast. We stayed here 2 separate times on our last trip, bookending an excursion over to Tikal. It's a great resort for the money, far less than the eco-resorts outside of town but with a little less of their expectations. The view is fabulous and the location is spot on. Perched on a hill above San Ignacio, you are also across the street from the Mayan ruins at Cahal Pech. We would stay here again, especially in the bungalows on the hillside. If you want to stay in one of the eco-resorts, this is one of the cheaper ones, although still extortionate compared to the places in town. It is one of my favorite resort stays ever though. The grounds are beautiful, the staff goes the extra mile, and the food at the restaurant is out of this world. You can rent canoes to take out on the river, or just read in the hammocks. Two night minimum stay. A traffic light in Belize City, one of only a handful of traffic lights in the entire country. Most hotels and resorts can organize transportation to and from the airport or you can rent a car from the airport. Driving is fairly safe in Belize as there isn't much traffic and there are only 5 highways (that means paved, 2 lane roads) in the whole country. You will need to watch for pedestrians walking along the highway. This blog has great tips for driving in country. There is a bus you can take to the Zoo--head to Belize City Bus Terminal and look for the non-express bus heading to Benque or Belmopan. Tell the driver you want to get off at the Zoo. Leaving the Zoo, you will need to walk out to the highway and flag down a non-express bus going your way. I have never done this since I have always been traveling with large groups of family members or very small children but enough people talk about it on TripAdvisor forums that I believe it is pretty common. This would definitely be the cheapest way to get to and from the Zoo. I have always used William's Belize Shuttle on my trips around Belize and have been very pleased. We paid $25 USD per person for a group of 8 to travel to San Ignacio from the airport. You can stop at the Zoo on the way, which makes the price $35 USD per person. All four times I have used William's Belize Shuttle, they have been on time, good drivers, and lots of fun to talk to. The drivers have been great sources of information about Belize and answering all kinds of questions from the political to the pop culture. On our last trip, our driver Fermin also happened to be a volunteer at the Zoo and offered to walk around with us, giving interesting background info on many of the animals. He really helped make our Zoo trip awesome. The Belize Zoo was a wonderful stop on our way from San Ignacio to Belize City, and I am kicking myself for not having gone before. We will plan a stop again on our next trip with an overnight stay at their Jungle Lodge and a night tour of the Zoo. Looking forward to it!